First off; the snare was beautiful to look at! With a nice dark wood finish, classic lugs, and a classic bronze Ludwig emblem, this snare really had the vintage look. There were many different types to choose from also, so you could customize your drum set a lot better. The classic lugs were nice, as they were not touching the snare the whole way down and were fairly thin. This brought down the weight of the whole drum altogether which is nice for the traveling drummer. The Ludwig emblem makes you feel like you truly have a vintage drum that is one in a million. The fact that this drum is not as common as others is another big selling point for many. The drum itself is a 6-ply maple shell. This is a very nice medium for snare drums, as it is not too thick, and not too thin. This keeps the drum nice and light, with enough power to keep up with the rest of the kit. It comes equipped with die cast hoops and lugs, very nice for tuning. The one hit snare switching makes changing from snared to unsnared very quick and easy! Like most drums, the vent holes on this drum are accented by the vintage looking Ludwig cymbal. This drum has its lugs floating away from the drum. This is nice for a number of reasons, one it frees up the shell of the drum, allowing it to maintain its sound a little better then others. Also, it looks a lot nicer and cleaner than most snares. A very sturdy and well made drum! Enough about looks, lets get to the heart of the instrument – the sound. This snare drum offered a lot of attack. For such a light snare, the amount of attack and crack this produced blew my mind. It wasn’t a messy sound either, it was very controlled. Ludwig definitely did something right with this snare! The tone of the drum was very rich, offering a nice equal sound both snared and unsnared. Although the attack was very fast, the volume wasn’t as loud as I wanted. This is mostly due to the size of the vent hole in the shell; pretty small. All in all the crack of this snare was awesome! The snare drum did not have enough warmth compared to other drums. It has a nice sound for a snare, but there weren’t enough low frequencies. Although tuning this drum is easy, it is a little tuff to get a balance from your lows to highs. This can be a problem for some who are looking for an all around snare, however, for those who want powerful attack and crisp sounds, this snare is for you. The sound of the drum with no snare is very nice. This Ludwig drum holds its tune very well, as it fits in to practically every drum set it is played with. I find this snare is played better, and sounds better, when it is tuned tighter and higher then normal. All in all this drum is a must have for the serious drummer! It offers great attack, speed and crack. 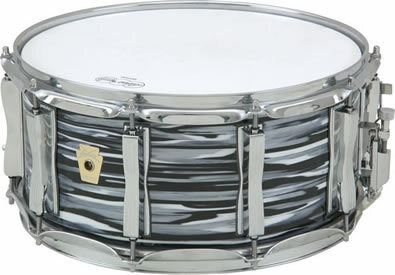 This snare would be perfect for Rock, Punk, Latin, Reggae, and metal bands. The light weight and vintage look of this drum give it a one of a kind feel that will accent your drum kit very nicely! The only thing I didn’t like about this drum was its lack of sustain and warmth; however this can easily be overlooked due to the other strengths of this snare. If you are looking at getting a unique addition to your kit, this is the way to go.